At Baymonte Christian School, we take pride in being able to offer small class sizes for our students, kindergarten – eighth grade. In order to offer a small class size with increasing budget demands we strive to find that balance of just the right number of students per class. A couple more students in each class would ease the pressure on our school budget. Our school board has approved an exciting initiative. We are calling on you for help! Do you know a family who would love Baymonte? Refer them to BCS and receive a significant discount at the same time! Baymonte families are invited to refer a friend to our school. 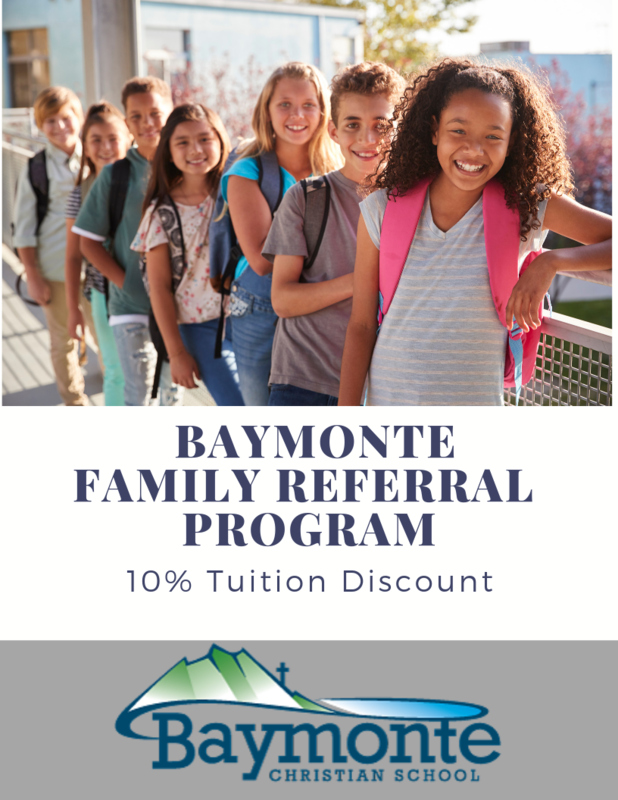 If that friend enrolls at Baymonte both families will receive 10% off 2019/2020 tuition. There is no limit to the number of families a Baymonte family can refer. This discount will only be given to one referring family. The Baymonte Family Referral Program runs from April 1, 2019 through May 31, 2019. Contact our admissions office to start the program or if you have any questions – admissions@baymonte.org.